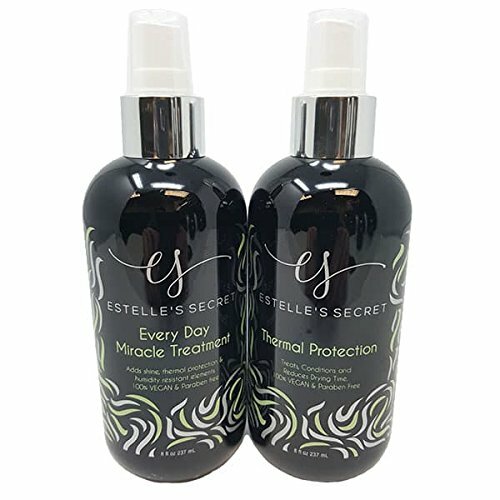 Estelle’s Secret Every Day Miracle Treatment is the ideal solution for controlling unruly, frizzy, dry and damaged hair leaving it silky smooth and full of softness and shine while offering thermal protection. Also works to make hair stronger, healthier and more manageable in a natural way while protecting and extending the life of color-treated hair. Estelle’s Secret Thermal Protection contains an exotic blend of lightweight oils to protect hair from heat styling. Smoothens while adding shine and nourishes troubled hair. Delivers heat into the cortex of the hair shaft while protecting the cuticle. Weightless, humidity resistant formula keeps hair lustrous and sleek for the entire day. Great for hair extensions and all hair types. Whether you want to take extra care of your hair extensions or just want your own hair to shine and be healthy, this elite duo of hair care items is a must for any girl. Estelle’s Secret hair care line is salon quality and when you bundle the more you buy the more you save! Each of our hair care items has a thermal protection built in to guard your hair against the damages caused by blow dryers, straighteners, and curling irons. Transforms dry, damaged hair into silky smooth locks. Protects hair cuticles from heat damage. Creates manageable, frizz-free hair. Smoothens and hydrates frizzy hair. Protects against environmental damage. Leaves hair beautiful, soft, and shiny. Save 10% by purchasing bundle. If you have any questions about this product by Estelle's Secret, contact us by completing and submitting the form below. If you are looking for a specif part number, please include it with your message.